Even if some Americans don’t remember Occupy Wall Street, as a recent article claims, its lasting influence is nearly impossible to ignore. Last week, Quartz’s Shelly Banjo wrote an article obliquely titled “Remember Occupy Wall Street? Probably Not.” Her first point of evidence is that a longitudinal search of headlines reveals that those about “Occupy Wall Street” more or less dropped off by 2013. More damning, she writes, is the fact that “Occupy and its antecedents didn’t really move the needle much in terms of popular opinion in America,” pointing to a modest 3 percent increase (since 1984) in the number of Americans who believe in a more even distribution of wealth. Banjo concludes that, “although the Occupy protesters moved on, things haven’t changed much at all.” But is it really that simple? As nearly any organizer who was involved in the movement will tell you, Occupy had its fair share of problems. There are sympathetic journalists, writers and graduate students spilling entire dissertations and books worth of ink hashing out the movement’s flaws, work that will likely prove crucial in understanding how to build bigger, better and fiercer movements in the future. Wrapping our collective minds around where a movement went wrong is some of the most vital work that can be done once the peak of excitement passes, but there are writers thinking much more critically than Banjo about what drove Occupy astray and how to get other progressive uprisings back on track. Occupy’s decision making body, the General Assembly, was not only “ill-equipped to address the day-to-day needs of the encampment,” as strategist L.A. Kauffman wrote recently in the Berkeley Journal of Sociology, but created a bottleneck in leadership that actually prevented organizers from making decisions that could have kept the movement alive. 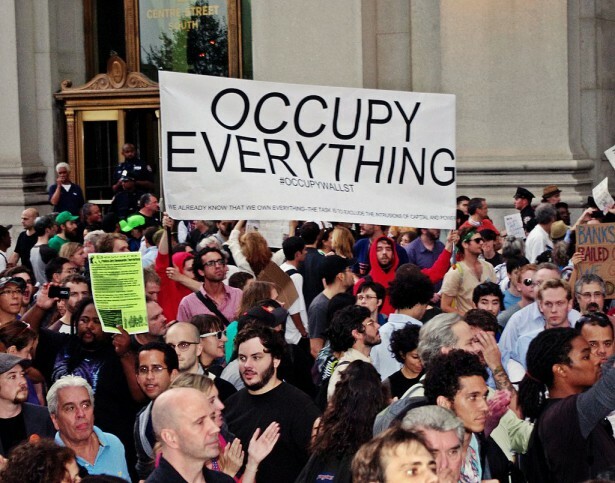 While the broad banner of “Occupy Everywhere” presented those using it with a built-in platform and publicity, the lack of clear guiding principles to determine what was and what was clearly not a part of the Occupy movement allowed the message to be watered down. One-time Occupier and sociologist Jonathan Matthew Smucker has argued further that some participants’ attachment to the holy ground of the encampments and their associated structures (kitchens, libraries, reading groups, etc.) created a ticking time bomb for defeat as colder weather and police repression closed in — not to mention a profound confusion about what activists were after in the first place. According to Smucker, “If participants are motivated by hope of psychic completion — by community and a strong sense of belonging — and such motivation is insufficiently grounded in instrumental political goals, their energies will likely go into deepening group identity over bolstering the group’s external political achievements.” Occupy, in other words, became more about the act of occupying than of taking on Wall Street. Critiques in mind, there have been legitimate wins from Occupy, however indirect, that deserve to be claimed. For one, there are polls, like the one Banjo used to make her point, that directly contradict the story that Americans’ views on income inequality remain unchanged. Another Gallup study released in January found that, since 2001, Americans’ satisfaction with “opportunities to get ahead by working hard” has declined by 22 percent, with a stark drop-off after 2008. Among the middle third of the population, those making between $30,000 and $75,000, dissatisfaction was as high as 80 percent. More important than the polls, however — which can be used to make just about any point with the right wording and spin — is the extent to which a conversation on inequality has seeped into the mainstream. Perhaps the best testament to Occupy’s long-term success is how accountable even its ideological enemies feel to the movement’s key talking points. “Until recently, most Republicans dismissed arguments about inequality as an invitation to what they labeled as ‘class warfare,’” reported the Los Angeles Times’ David Lauter. “Now [Jeb] Bush, as well as Florida Republican Sen. Marco Rubio and other GOP hopefuls, have publicly identified the issue as a key problem facing the country.” Even Hillary Clinton, a Wall Street-friendly Democrat who could make Andrew Cuomo look like a dark horse, is now campaigning as a populist. Candidates have good reason to be paying attention: When Mitt Romney, the well-heeled private equity manager, declared that “corporations are people” in the summer of 2012, it all but cemented his image as the candidate of the 1 percent. While Romney had planned to argue that his experience in business would enable him to run the country like one (read: “efficiently”), touting his Wall Street credentials quickly became a liability as the Occupy movement sprang up in the streets and, crucially, engrained itself into popular consciousness. What’s more, as Romney fell, progressive candidates like Elizabeth Warren, Kshama Sewant and Bill DeBlasio were able to cash in on the economic populist energy of Occupy at the polls, campaigning on platforms to address unemployment, raise wages and benefits, and hold big bankers to account. While the most meaningful — and hardest to measure — influence of Occupy may have been the baptizing of a new generation of organizers, there are plenty of institutionally-vetted victories for which the movement can take hearty credit. As for its shortcomings and failings, researchers are turning out a bevy of worthy reflections to help popular rebellions learn how to improve their odds of success. Therefore, even if some Americans don’t remember Occupy Wall Street, its lasting influence has become nearly impossible to ignore. It is pretty odd to claim that Occupy somehow inspired the movements in Spain and Greece, given that the Indignados started their waves of protests and occupations in May 2011 and the widespread street protests and riots in Greece, which fed into the rise of Syriza, started kicking off in May 2010. I do think Occupy has mainly been useful for helping connect people who might not have otherwise connected, and leading to organizations and networks that are strong and growing today. For example, my understanding is that Socialist Alternative in Seattle was heavily built out of networks created during Occupy.